Omnetics' Micro-D Connectors are ideal for critical, high reliability industries including aerospace, military, and medical. They are also used in devices such as optics, guidance systems, on-board equipment, space and UAV systems. They are built to meet or exceed the specifications of MIL-DTL-83513. Highly rugged and compact designs in shell styles from 9 to 51 contacts. The Micro-D connectors incorporate Omnetics one-piece flex pin design for greater shock and vibration resistance.The high reliability gold plated flex pin is designed for >2,000 mating cycles. 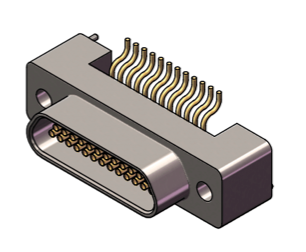 Omnetics Micro-D connectors will operate from -55ºC to 125ºC.